While many truck and SUV owners will never use their powerful vehicles for hauling stuff, that almost seems like a shame. Afterall, while vehicles such as the GMC Sierra Denali are obviously posh and comfortable, the real strength comes from it's ability to haul "stuff". Unfortunately though, all too often the proper way to perform these tasks is simply an afterthought until you find out you did it wrong. Here's some tips I learned this weekend while at the Tow Like a Pro event hosted by GMC. According to GMC, 75% of all Light Duty truck owners tow - but 30% of those owners don't know how much weight their trucks can haul. Even fewer have actually had any sort of training on how to do it correctly. This can become a major problem that may lead to damage of the truck's frame, engine, and transmission - as well as that of the trailer and cargo. The easiest way to find this information is simply to consult your owner's manual. However, if you have added aftermarket parts such as hitches, tires, and lift kits than this stock number will change. In our case, we were using brand new 2018 Sierra Denali trucks and they were fantastic to drive. With a max trailer rating of 12,500 for the Sierra 1500 and 23,300 for the Sierra HD it's ideal for towing anything you can imagine. Tongue Weight - this is the weight as measured at the hitch point on your truck from the tongue of the trailer. Trailer Weight - this is the weight of the trailer and all cargo contained on and in it. When you add Gross Vehicle Weight and Trailer Weight, the combined number is referred to as the Gross Combination Weight. To understand how much your truck can handle, it is essentially that you know both the combined weight number as well as especially the tongue weight and trailer weight. However, your truck needs to be able to haul not just that ... but also the truck itself. So, when adding everything up, make sure to include both in your calculations. Most light duty trucks (such as the Sierra 1500) will use a standard weight carrying towing hitch. As you go up in weight though, your trailer might need a weight distribution hitch or possibly a gooseneck hitch to better support the load. 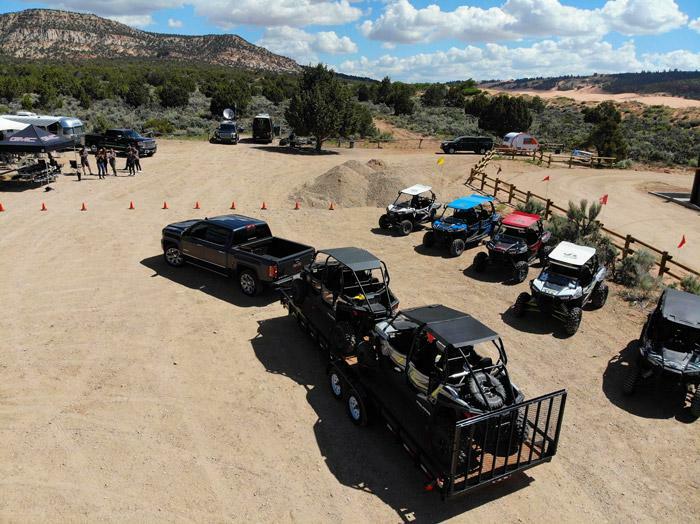 In our case during the towing demonstration, our trailer and cargo weighed only 7,000 pounds and had 2 4-seat Polaris RZRs using a standard trailer hitch. While this standard ball-and-socket hitch is sufficient for loads such as small boats and camping trailers, heavy loads such as large farm equipment, horse trailers, RV's, and toy haulers start to need the added benefits of a weight distribution hitch. The key benefit here is that it helps to control the weight better so as to allow better control of the tow vehicle. For instance, under a standard hitch if you have too much tongue weight, that can press down on the back of the tow vehicle and potentially force the front wheels off the ground! A weight distribution hitch helps to avoid that. Here's more information from our friends at Care Your Cars to better understand how to select the best weight distribution hitch. Ultimately, the tongue weight should be limited to 10-15% of the total loaded trailer weight. Safety is everything when it comes to towing. Not only do you want to protect your valuable cargo but and improperly configured trailer could cause damage to the truck as well as others around you as well. That's why it is critical that you do a safety check before heading out on the road. Mirrors - adjust the mirrors so that you can clearly see the end of the trailer. Lights - make sure that all lights on your truck and trailer are functioning properly. This includes signals, taillights, and especially the brake lights on your trailer. Brakes - Not only should your truck's brakes be functioning properly, but so should those on your trailer as well. GMC recommends that any tow weight of more than 2,000 pounds should have trailer brakes. In the Sierra, these can even be adjusted from inside the cab to help reduce swaying as well as minimize disruption in start and go traffic. Ensuring that these are functioning properly as well as calibrated properly for your load will help to ensure that you have a safe journey. Tires - Your tire pressure on the truck as well as the trailer must be inflated to the correct weights to ensure a smooth ride. Trailer Hitch and Safety Chains - Make sure that the hitch is in proper condition and that safety chains are attached properly still. Wires and Cables - Rough roads can cause wires to break, bend, or be damaged in other ways. Make sure to check your wires leading to brakes and lights regularly. Ensure that the Load Is Secure - You'll also want to ensure that the load is secure. Depending on what your are hauling, this could include tie-down-straps holding a tarp covering boxes or something more specific. No matter what your cargo is, it should always be balanced properly on the trailer and not able to shift. In addition to checking these items before leaving for a trip, you should perform a similar inspection each time you stop. With your truck and trailer properly loaded and ready to go, it's time to hit the road! Many of the same considerations for towing as the same as normal driving - but exaggerated. For instance, you will want to accelerate and brake gradually to avoid overworking the engine and brakes. Plus, you need to leave more space between your vehicle and the one in front of it - GMC recommends at least 4 seconds of travel time. Additionally, you'll want to check your tire speed ratings and limit your speed to that number. While you might normally travel at 70 or even 80 mph depending on your route, if you have a load and your tires are only rated to 65 mph then that highspeed travel could cause damage to the tires as well as a less stable load. You'll also want to make sure to have more space than you think you need for turns as well as passing since you will want to avoid sudden quick movements. Trailer sway is something that will happen under various conditions including wind, road conditions, or even an improperly balanced trailer or tires that aren't inflated properly. 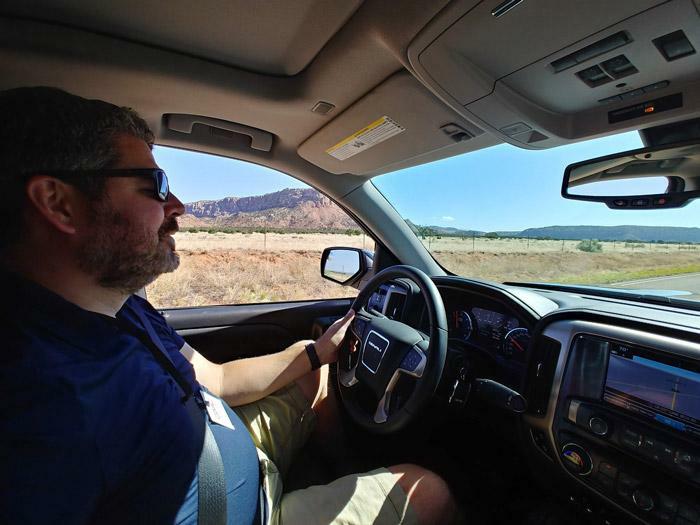 Should you encounter the situation, you should hold the steering wheel steady, release the accelerator but avoid braking, and then activate the electronic trailer brakes by hand until the swaying stops. Ultimately, depending on the severity and cause, you should gradually apply the vehicle brakes and come to a complete stop in a safe place so that you can check the trailer and cargo to eliminate any potential causes. For more towing tips, make sure to check out the GMC Towing and Trailering site.